The Builders Arms is a very common name for a pub. There are two in Croydon and there is a another one called The Joiners Arms. They clearly used to aim for specific types of people to share their products with, or more likely, wanted something other than The Cricketers which is also a very common named pub around these parts. The one on Leslie Park Road was the pub we would go to when we lived in our last flat but we have not really gone back since. So for the FA Cup final off we went as getting tickets to Wembley or even to watch it on the big screen at Selhurst was practically impossible. I like the pub, its decor and layout but I had a lot of other things on my mind so did not even want to go along but my partner encouraged me because of his family coming over to watch the game and get food. It was loud. The shouting at Mark Clattenburg and at the game in general by all in the pub made me cry several times. Pubs make me anxious as there is no escape once you are sitting down and there is always somebody at another table you end up coming into eye contact with everytime you look up. 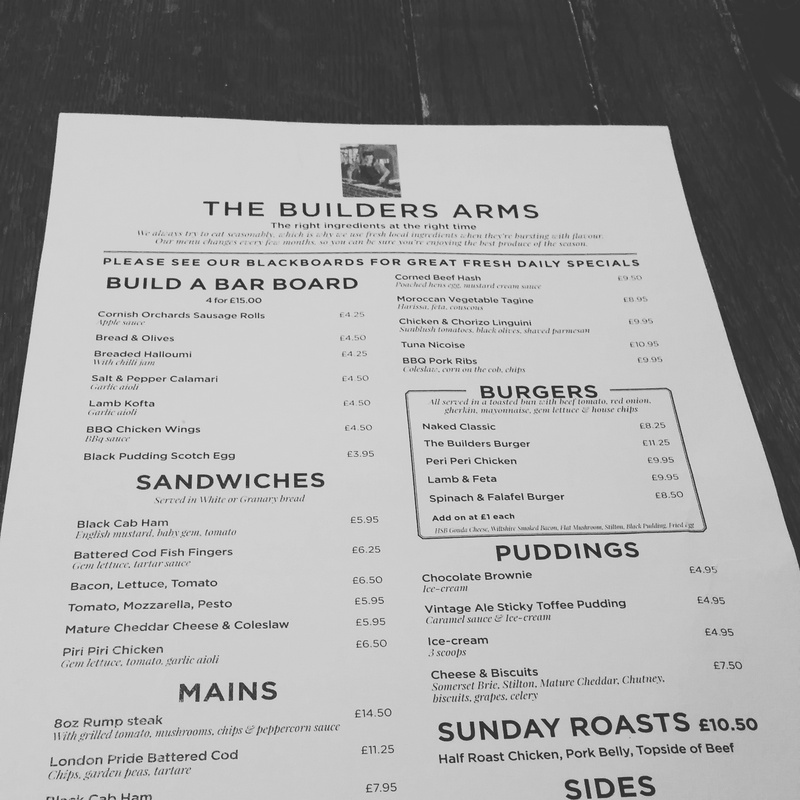 As we had not been there for a while, and it is run by Fullers, the menu gets changed on a seasonal basis and was largely different from what was available last summer. I looked up the menu in advance. I knew what I wanted to have. I hate the pressure of figuring out what I want and also find dilly-dallying over choosing to be infuriating and stressful. So after some people had starters the lamb and feta burger arrived. 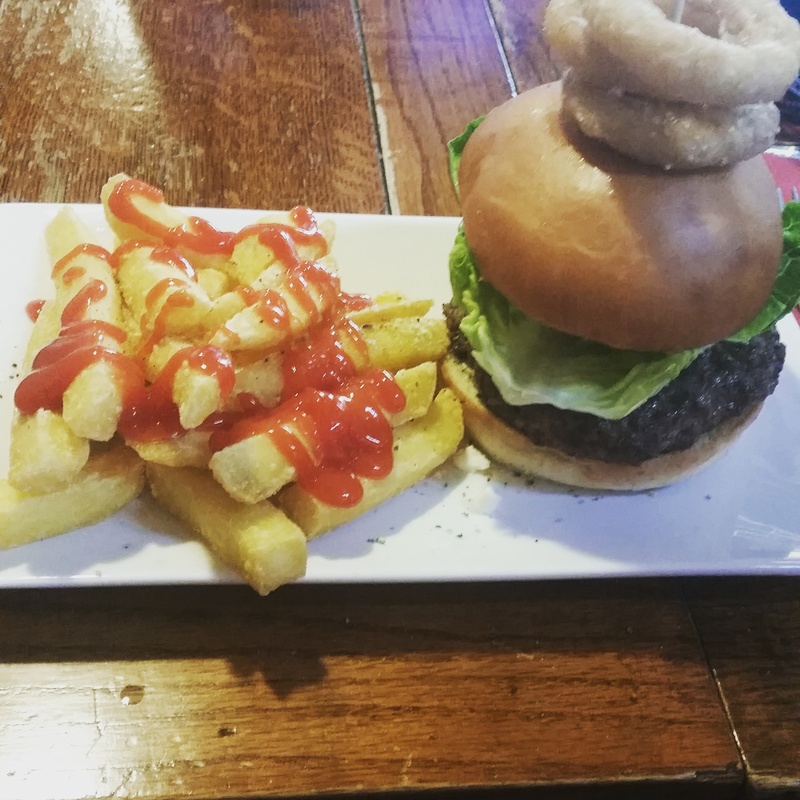 It made such a lovely change to get to have a tasty, juicy and full of flavour lamb burger instead of the usual beef ones. The meat was cooked perfectly and it held its form superbly well. As with many burgers in pubs and restaurants these days I had to deconstruct it slightly to be able to actually eat it. I wanted to consume the salad within but to make the bun more stable I had to eat it seperately which is no big issue but can make the meal seem a little fiddly. The feta was crumbled up on top of the burger and obviously remained in its stubborn unmelted state that only fets can understand. It helped to add a little bit of sharpness and saltyness to the meal without overpowering the tastebuds. I feel that mixing the feta into the lamb meat for the burger could work better as the crumbs did escaping out the burger but it was a delight to eat. The chips were crispy on the outside but remained fluffy inside making them a delight to pick up and eat one by one. The lamb and feta burger is something I would certainly recommend if you happen to be going into a Fullers pub that is still selling it before the end of Spring and lambing season is well and truly here. We left it quite a while before dessert and it was at some point during the later end of the football that it arrived. I asked for the sticky toffee pudding which came with ice cream. Firstly, I love the plates. Plates that are this shape can be quite frustrating but this being served on it was perfectly okay but what got me more excited was the little section that allowed for a mini ice cream ramekin to be put there without it slipping around all over the place. The ice cream was lovely and very creamy. 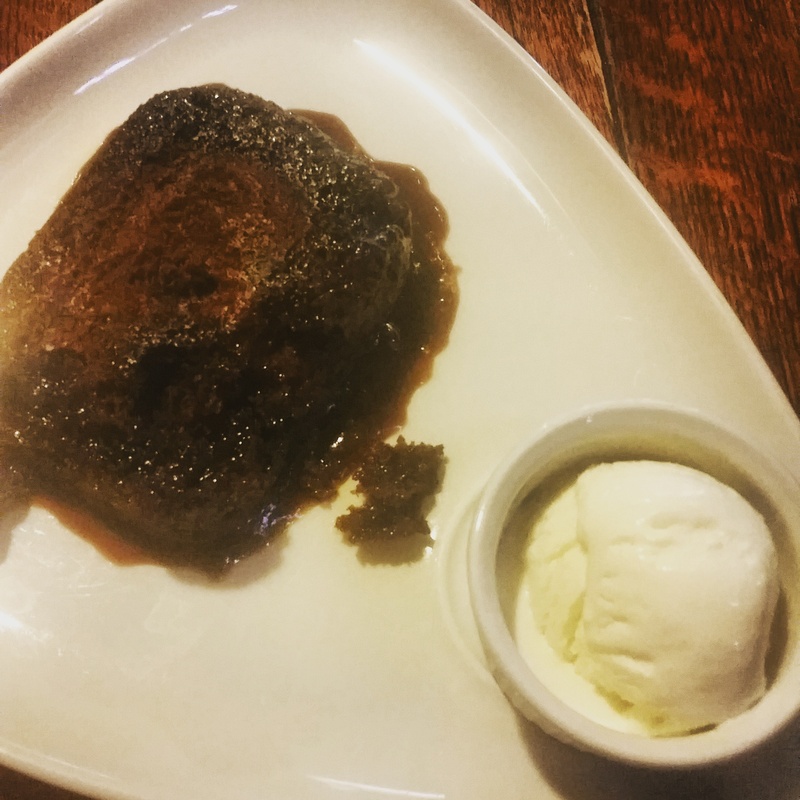 It was warm in the pub so it started to melt very quickly so I ended up drizzling most of it over the sticky toffee itself. But on a day where it has chance to survive I would certainly consider just getting a bowl of three scoops of the stuff! I felt the sticky toffee itself was a little lack lustre but it did not stop it from being tasty. If I am having a dessert out I often expect it to be obviously sweet but the toffee sauce did not seem too sticky or sweet at all. The sponge itself was moist and soaked up the sauce and ice cream really well without having the taste of it ruined. At the minute the dessert section is quite small and I would consider opting for a starter rather than a dessert even though I normally prefer dessert of starter. There was absolutely nothing wrong with the sticky toffee but it was not quite to my taste and knowing they use Brakes for some of their food, I have walked past as they have got a delivery, I felt this came from the supplier which explained the tub shape marks on the top of it. Still thr pub has a lovely atmosphere and is great to go to as either a lonely sport loving sole, a couple or a bigger group of people. The staff in there are brilliant and have the ability to make suitable and clear to read banter. A lot of noise echos around the place however and if you are sensitive to sound you might want to check the sports fixtures or be prepared to sit outside for some quiet and fresh air (although the beer garden is for smokers so perhaps not too fresh). Would highly recommend to anybody living in Croydon or around for a few days as the walk from East Croydon station is not as far as certain maps may have you think. This entry was posted in Food and Drink, Restaurant Reviews and tagged burger, cake, Cheese, chips, dairy, dessert, dinner, Food and Drink, food blog, food blogger, food bloggers, food review, fullers, ice cream, lamb, lblog, lblogger, lbloggers, life, Lifestyle, lifestyle blog, lifestyle blogger, lifestyle bloggers, lunch, main, meal, pie, pub, pub meal, pudding, restaurant, Restaurant review, review, seasonal, sponge, spring, summer, sweet. Bookmark the permalink.